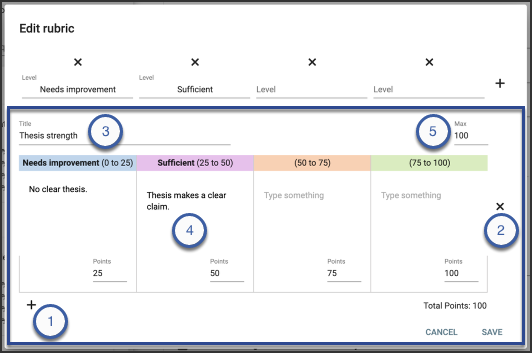 How do I create and edit rubrics for Peer Assessments? 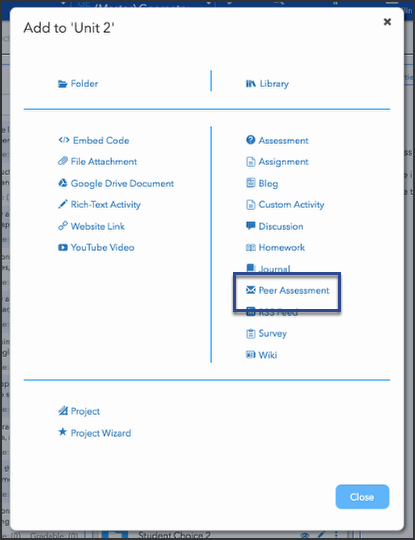 Create the Peer Assessment activity (if you're adding a rubric to an existing Peer Assessment, follow these instructions). Click Add Rubric. If rubrics already exist in your domain, you can choose one from the Select a rubric template dropdown to work with it; if you want to create a new rubric, select <empty>. Follow the steps outlined in Create and edit rubrics, below. Add levels by clicking the plus sign that appears to the right of the levels fields. Provide level titles by clicking the level's field and entering text. If you don't provide titles, level headers display Level 1, Level 2, Level 3, etc. By default, the levels build, left to right, from lowest scores to highest. Provide the maximum criteria score in the Max field. This value is automatically distributed evenly between the existing levels in the criteria and populates the Points fields and level headers within the criteria. You can edit the Points fields if you don't want the value distributed evenly, but you must do so after entering the Max value.